Program for burning data, audio, multimedia, video and hybrid Mac/PC CDs or DVDs on Mac OS 9 and Mac OS X. Even burn discs in the background while you continue to work! Supports virtually all USB, IDE, SCSI and FireWire CD recorders. Resolves an unexpected quit when preparing a disc with very specific sizes of data files. Left and right audio channels are no longer reversed when burning DVD Music Albums (requires Toast with Jam 6). Resolves an issue where sub-menus in very large DVD Music Albums would link to an incorrect track (requires Toast with Jam 6). Audio is now properly encoded in DVD Music Albums for tracks that are option-dragged into the content area (requires Toast with Jam 6). Resolves an issue where artifacts may appear when encoding using High Quality settings or when reencoding existing content. Resolves an issue where multiplexed MPEG files with AC3 or MPEG audio may fail the MEI verification test. DVDs without menus now correctly start playing with the first title on the disc. Resolves an issue where the Abort option would not abort the encoding process. Creating video discs from PVR content no longer has A/V synchronization issues. Resolves an unexpected quit when preparing a disc with certain video files. Files sizes for pre-existing MPEG content are now calculated correctly when determining disc capacity. Addresses a minor security issue in the Toast Disc Image Mount kernel extension. See http://secunia.com/advisories/13476/ for more details. Copy window now displays correct information about DVD-Video source discs. Resolves an issue where existing data may be overwritten on a DVD+RW if the blank disc is inserted immediately when the "Insert Disc" sheet is displayed. "Toast It" contextual menu now properly follows the post-recording verify preferences. Addresses an issue where over 90% of CPU cycles is used while erasing a disc. Double-Layer (DL) support for data, audio, video and copy formats. Improved pass-through (do not re-encode) for pre-existing compliant video content. Improved status messages during video processing. Pre-existing compliant video content that is passed-through now say "multiplexing" versus "encoding". Automatically creates additional slideshow buttons to the main disc menu when adding more than 99 images to a Video CD, Super Video CD or DVD slideshow. Automatically creates additional playlist buttons to the main disc menu when adding more than 99 tracks to a DVD Music Album playlist (requires Toast with Jam 6). List view option now available in the Edit sheet for photo slideshows and DVD Music Album playlists. Auto-Play option added to DVD Video. This option begins playing the first title on the DVD automatically when it is inserted into the player (bypassing the main menu). Each title will continue to play automatically, until the viewer chooses the "Stop" or "Menu" buttons. Support for 12x and 16x DVD recorders. "Write Session / Write Disc" terminology restored to Record dialog Advanced tab. Audio CD now accepts audio files up to 192 kHz/24 bit. Playlist order maintained when drag/drop from iTunes into Audio CD or DVD Music Album. Additional 3rd party images supported for image copy. Copying from +R discs now works correctly. PAL VCDs with slideshows and menus now playback correctly. "Toast It" no longer defaults to "Write Disc" when recording. Custom Hybrid CD burning from a Toast temporary partition now works correctly. Language support for French, German, Italian and Japanese. Summary of number of items and playback duration in Video format. Menu item to Duplicate videos or slideshows in Video format. Audio Master Quality Recording support for Yamaha recorders. Buffer Underrun Prevention option available for combination DVD+R/RW and -R/RW recorders. Video disc format accepts more previously encoded content without attempting or requiring re-encoding. Status message may still say "Encoding" while Toast verifies that the file is valid. Support for recording application bundles and installer packages. Support for mounting and copying additional 3rd party image formats. Support for copying complex BIN/CUE formats. Selecting different recorders or mounted images for CD/DVD copy source. Recorders connected to USB 2.0 ports now display full USB 2.0 speeds in Recorder setup. Mac OS 10.2.8 or higher is required for USB 2.0 support. More accurate disc space required calculations. More accurate progress and time remaining calculations. General performance, stability and launch improvements. Miscellaneous cosmetic interface issues for full Panther support. include updates for Spin Doctor and Motion Pictures. 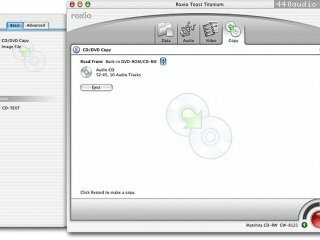 Toast 5.2.3 Titanium enables the Buffer Underrun Prevention option for combination DVD+R/RW and DVD-R/RW recorders when using -R/RW media. Buffer Underrun Prevention is not an option when using +R/RW media, since the recorder uses the built-in error prevention that is part of the +R/RW specification. Parfait pour graver des cd de données, des cd audio ou des cd "audio + multimedia" lisibles sur Mac et pc bien sur !